If there’s one kitchen appliance that’s a real kitchen workhorse, that would be the food processor. This device does a wide array of jobs that would have been time-consuming to do by hand: blending, mixing, pulsing, pureeing, chopping and shredding various ingredients. From making mayonnaise and baby food; mincing fruits, chopping nuts to emulsifying wet ingredients, it’s easy to see why the best food processor deserves its place on any kitchen counter. But food processors aren’t created equally. In fact, preparing meals for a one or two people or processing just a small batch of food is better achieved by the mini food processor. Mini food processors are modern kitchen devices which are smaller than the standard-sized food processor. A mini food processor comes with blades and disks that can julienne, dice, cut, slice, puree and do a lot of other tasks. The blade or disc is at the centre of a bowl that’s smaller yet wider than that of a regular food processor. The lid of the container may or may not come with a feeding tube wherein sliced ingredients pass through entering the bowl. These devices are not called “mini” for no good reason. Standard food processors can cater large batches of food with most models being able to accommodate more or less 14 cups. Mini food processors, on the other hand, can prepare small batches, often ranging from 1.5 cups to 8 cups with several models hovering around 3-4 cups. Additionally, you can expect mini food processors to be smaller in size, so they also tend to be lighter and require minor kitchen real estate. With that said, it’s easier to get and store mini food processors from the cupboard, and they won’t need as much space if they become a permanent fixture on the countertop. Would you like to get your mini food processor? Below is a comprehensive review of the top 5 mini food processors and a buying guide, but you can click the link above to see current prices and read customer reviews on Amazon. There’s a broad range of mini-processors in the market nowadays and picking the best one for you could get overwhelming. To help you trim down your options and ultimately find the right product, we’ve put together this mini food processor buying guide. It goes without saying that a mini food processor needs to be versatile. However, the level of versatility can depend from one product to the next. An excellent food processor should be able to perform various tasks even with its small size. Check what food preps you can do – pulse, puree, mix, slice, dice, mince, etc. With that said, look at the functions, blades and blade/disk attachments to see if you can easily swap them up as your food prep needs change. In food processors, the blades are significant in delivering consistent, beautiful results. Look for durable stainless steel blades to prevent any issues of rust and corrosion. Additionally, high, sharp blades can chop, slice and chip even hard ingredients like carrots and beetroot. Several types of modules come with your food processor. For instance, a chopping blade, which is common in several models, can chip fruits and vegetables in seconds. There are also reversible blades which feature a chipping function at one side and a grater at another. There are even modules specifically designed for kneading the dough. Aside from the blade that readily comes with the food processor, a lot of models also provide some extra blades for various purposes. This feature makes the mini food processor even more functional and versatile. Just ensure that these interchangeable blades are easy to attach and detach for quick and convenient blade switching. It is typical for food processors to operate with some degree of noise and mini food processors are no exception. However, some models are less noisy than others. Noise is an important factor especially if you want to operate the food processor discreetly. Some devices are less noisy at 68db, but that’s still a little louder than the average human conversations of 60db. If you want a quieter food processor, make sure to set realistic expectations and keep looking for one with the least noise that you can find. Unlike regular-sized food processors which have large dimensions, going around two litres more or less, the mini food processor, as well, smaller than that. The bowl size of most mini food processors can accommodate somewhere between one to eight cups, on average three cups. If you’re chopping vegetables on a regular basis and preparing food for at least two persons, it is best to get a 3-cup capacity or more. You may get one with a smaller size if the primary purpose of the food processor is to prepare baby food. It’s important to determine how you intend to use the mini food processor and the number of people that you’re going to serve to get the best size. If used often, the mini food processor can take quite a beating. Opt for one with sturdy and robust construction, so it’s able to stand wear and tear. Most of these devices come with polycarbonate plastic which is durable. However, the plastic could get dull and scratch with use so it’s also good to inquire if you can get replacement bowls and parts. Additionally, try to get how sturdy the device feels. It should stand solidly against the counter and shouldn’t topple over easily. In most cases, the blades, bowl and lid parts of the processor are detachable. You should be able to pull them apart without any struggle, but they should also put back somewhat securely. Often, you hear an audible click if a part is put back safely into place. Ease of assembly also means you can detach the parts quickly after use and be able to wash and dry them promptly. 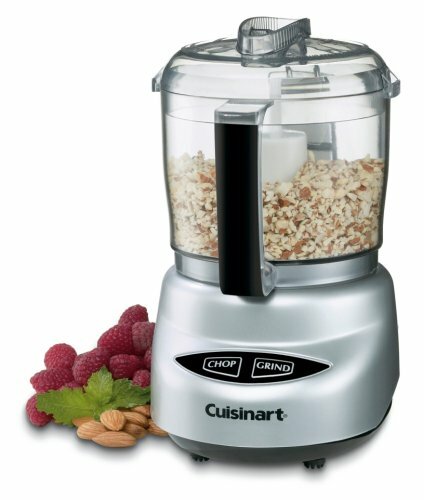 Utterly fast, powerful and efficient, this small processor does an excellent job of both grinding and chopping food. It has an impressive 250-watt motor and reversible stainless steel blade, so it’s expected to perform excellently, and it does! In between chopping veggies and cheese, mixing mayonnaise and butter to grinding nuts and spices, this device holds up very well. It comes with an intuitive control panel where you can choose between chop and grind. The chop function is ideal for softer food like cheese, garlic, onion and vegetables. The grind function is for harder food such as nuts, coffee beans and seeds. To pulse, just hold down the button in quick intervals. The Cuisinart DLC-2ABC Mini-Prep Plus takes on a sleek modern design, equipped with a cumbersome and sturdy base and durable plastic material. It has a capacity of 3 cups which is adequate for preparing small batches of food. It is also lightweight at 24 ounces and requires little counter or cabinet space. This food processor is relatively straightforward, no-frills and easy to use. And for its price, it’s also cost-effective too. The thick reversible stainless blades can chop and grind ingredients efficiently. It consistently and reliably performs various food preps. It is small and sturdy, requires minimal storage space. It grinds food too finely than desired. Grinding hard food may cause scratches on the bowl. Not all mini food processors will claim to be able to process frozen ingredients, but this one does. Equipped with powerful blades and a motor operating at 400 watts, the Ninja Master Prep can easily crush ice as well as grind and mince fresh ingredients. So on top of blending herbs, making butter and mayonnaise as well as preparing baby food, this compact device can also make delicious smoothies in seconds. 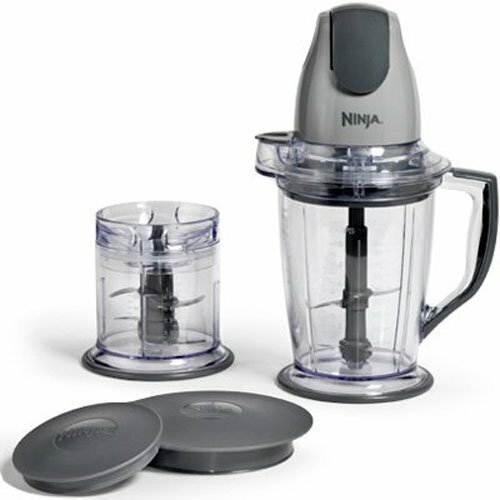 The Ninja Master Prep comes with two containers of different sizes (48-ounce pitcher and 16-ounce bowl) which allow you to prepare two different food batches. Each bottle also comes with powerful blades that can chop, mince, grate and grind. Additionally, the blades are situated at various heights to ensure optimum blending and processing. Modern and ergonomic in design, this mini food processor comes with a one-touch button so it should be easy to operate. Most of its parts are also detachable and dishwasher-safe. It also comes with a sturdy non-slip base and anti-spill spout to prevent accidents and spillages. It has an excellent ability to work with ice and frozen ingredients. It also comes with different-sized bowls, handy for preparing two different types of food. The food processor’s blades are in the bowls for even and consistent food processing. It is easy to clean. Most parts are dishwasher-safe. The material of the bowls comes with thin and flimsy plastic that can break easily. Food bits can get stuck in the nooks and crannies of the bowl. It has limited cutting option compared to other mini food processors. Whether you want to process food into a fine minced form or simply slice veggies evenly, the Black & Decker FP1600B 8-Cup Food Processor will indeed prove reliable. It has a larger capacity of 8 cups than other mini food processors in this list, making it perfect for medium-sized food preps. The container certainly gives you a lot of room to work with, whether chopping vegetables, blending ingredients or mincing spices. Sold at an affordable price, this Black & Decker FP1600B Food Processor does seem like a great bargain for its robust features. First, it has a compact design despite having an 8-cup capacity. It is also lightweight at only 6 lbs, making it easy to take out, use and store. The work bowl comes with a feed tube which holds food upright while the blade slices and chops. The two blade attachments allow for various food prep tasks. The stainless steel blades are ideal for mincing, pureeing and grinding. Meanwhile, the reversible blades are for shredding cheese, vegetables and other ingredients. 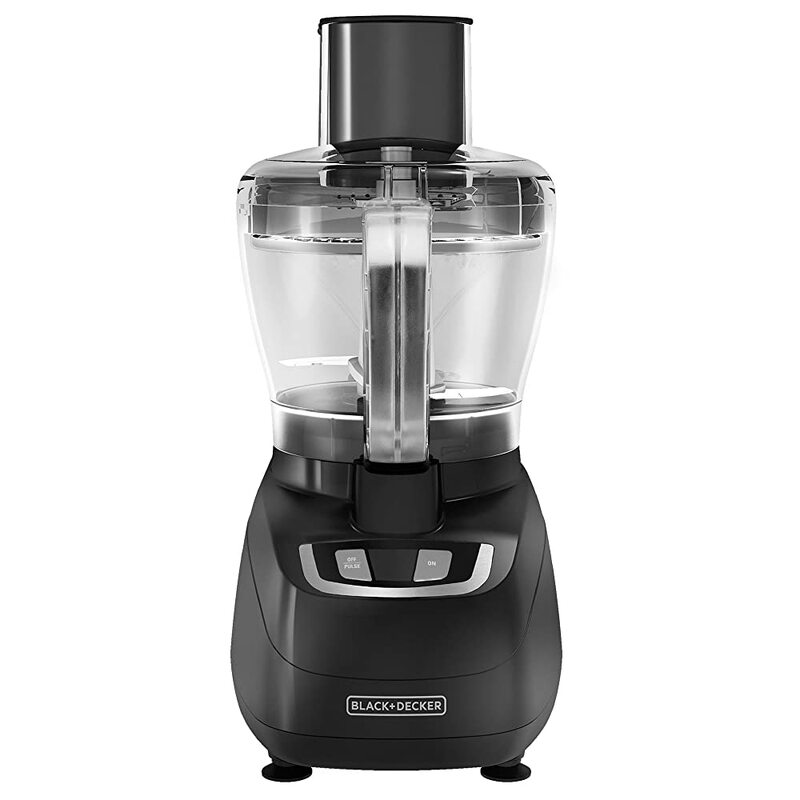 With that said, this Black & Decker FP1600B Food Processor will certainly go a long way regarding fulfilling various preparations and functions. Quite remarkably, this machine comes with safety measure that prevents usage when the parts are not properly assembled and put together. That prevents nasty accidents and possible damages to the device. Those non-skid suction feet also secure the food processor in place so it wouldn’t move around during operation. The larger capacity gives food a lot of room to move and blend. This device is light and compact, so it’s easy to move and store. The device won’t operate unless all parts are properly assembled and put in place. It is relatively inexpensive than other models. It comes with a short power cord. The device needs to be placed adjacent an energy source. It tends to very noisy. Coming from the renowned Hamilton Beach brand, this food processor may look light and compact, but it’s also efficient and powerful enough for various methods of food preparation. This Hamilton Beach mini food processor comes with a 3 cup capacity bowl. It comes with durable stainless steel blades which can process various ingredients with ease. This mini food processor comes with two pulse speeds so you can pick and switch gears quickly depending on your preparation needs. The bowl also comes with a tight lid and oil dispenser so emulsifying is seamless. The clear plastic work bowl also allows you to see your food preparation progress. Most parts of this device are dishwasher-safe, so clean-up is expected to be easy. It has a 135-watt motor which is ideal enough to perform basic food processing tasks. Lastly, the clear bowl shows measurements in litres, ounces, and cups which could come in handy for recipes that require precise measurements. 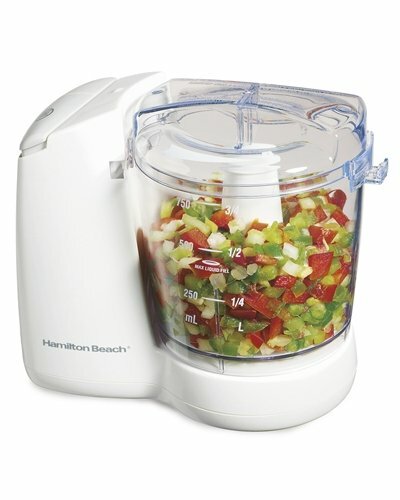 The Hamilton Beach 72600 can do most things that other mini food processors have to offer. All those little features add up and make this mini food processor a competitive contender. Most parts of this mini food processor are easy to attach, detach and clean. The work bowl comes with durable, high-quality plastic. The motor and blades deliver consistent results. It is unknown whether the plastic material is BPA-free. It is slightly more expensive for its essential functions than other models. 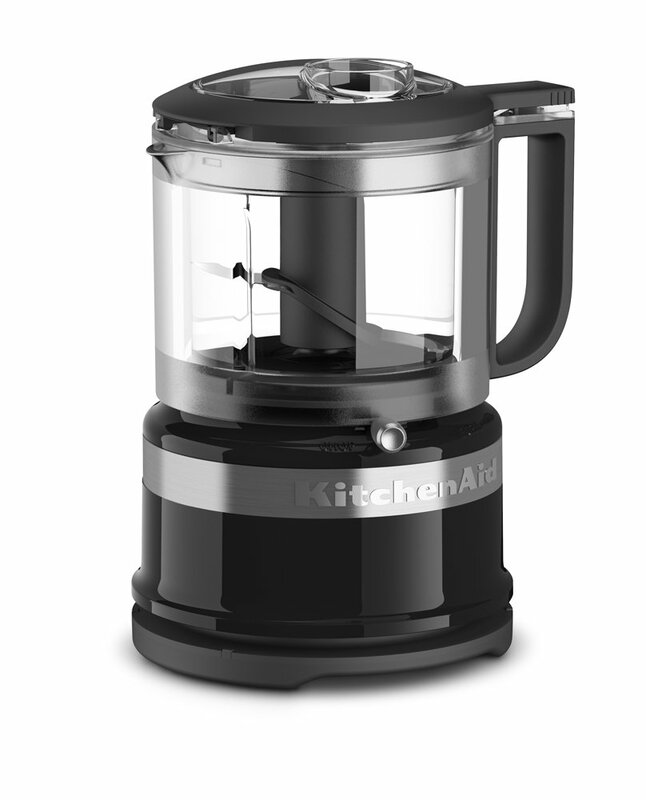 Kitchenaid is also a well-known brand for the kitchen appliance, and this mini food processor is an excellent representation for the brand’s reputation. The KitchenAid KFC3516OB 3.5 Cup Mini Food Processor is an efficient small-sized food processor with the capacity of 3.5 cups. It comes with two settings – chop and pulse – located at the top of the device. You only need to put the ingredients into the work bowl, cover with a lid and push the button to start prepping your food. What makes this Kitchenaid mini food processor a desirable choice is how consistent results are. Thanks to the sharp reversible blade, the ingredients always come out nicely and reliably pulsed and chopped. Additionally, the work bowl is made of a BPA-free plastic material to ensure safety while the lid comes with a drizzle hole to quickly emulsify ingredients. It has a capacity of 3.5 cups which is ideal enough for processing small batches of food. The mini food processor has a reversible blade which chops and pulses consistently. The work bowl is BPA-free. It is compact and lightweight and doesn’t take so much space in the kitchen. The lack of handle at the work bowl can make pouring and transfer food inconvenient. The device won’t puree unless you hold down the button without letting go. These food processors do great wonders to kitchen tasks. Mini food processors, even for their small size, prove to be a great investment especially if you’re always prepping small batches of food or don’t have enough kitchen space for a regular-sized processor. If we must take a pick among these five contenders, we say the Cuisinart DLC-2ABC Mini-Prep Plus is going to be an excellent, cost-effective investment. The Cuisinart DLC-2ABC Mini-Prep Plus it comes with “grind” and “chop” functions that allow you to quickly prepare hummus, salsa, mayonnaise, baby food and a whole lot of dishes. It also comes with a durable work bowl and sharp blades so that operation is smooth, safe and efficient. Most of all, it is decently-priced for the range of things that it can do. So if you must shop for a mini food processor today or sometime in the future, you must consider your own needs and preferences, consult our buying guide and begin with these top picks. Thyme – The Aromatic Plant We All Love!